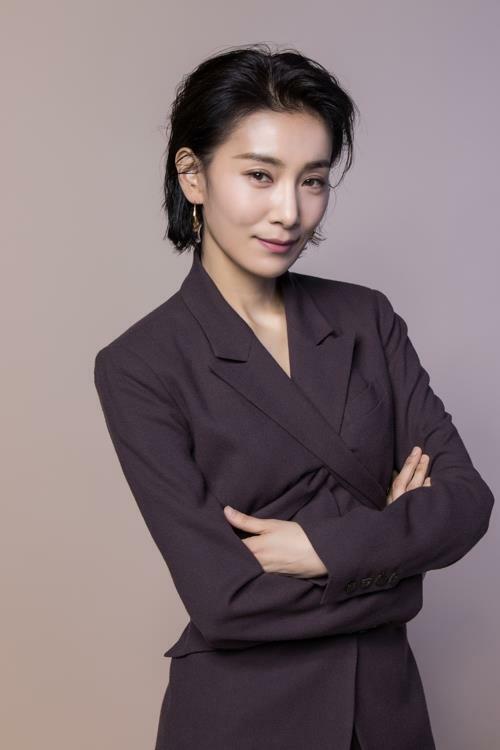 SEOUL, Jan. 30 (Yonhap) -- The supporting role of a shameless villain in an adulterous relationship that Kim Seo-hyung played in SBS' 2009 hit drama series "Temptation of Wife" brought her out of more than 10 years of obscurity. Neatly combed-back haired and dressed in all-black, when actress Kim Seo-hyung appears in the popular JTBC drama "SKY Castle," she steals the show with her domineering charisma and eerie, mysterious aura. The 45-year-old veteran actress plays cold-hearted personal counselor Kim Ju-young in the drama, who is hired by super-rich parents, who want to give their children easy tickets to the most coveted university to pass on their wealth and social status. "Hearing just that the drama revolves around mothers obsessed with their children's education, I was worried that it could end up being the same old soap opera with helicopter moms. But the first two episodes changed all that," the actress said during an interview with The Korea Times at a cafe in southern Seoul, Tuesday. "Each episode felt like a film with great cinematography and great directing. So to some extent, I forecast that it would garner good rankings. I thought it might rise to around 10 percent. But I didn't know it would be this successful." With just one episode left to go, the 20-part black comedy mocking Korea's insane education fervor has been enjoying an explosive response from viewers. The drama kicked off with 1.7 percent viewership for its first episode aired Nov. 23, but its latest episode aired Sunday surged to a cable networks' record of 23.2 percent, surpassing the previous record of "Guardian: The Lonely and Great God" with 20.5 percent. Kim is best known for her previous role as a mean woman who lures best her friend's husband in the daily drama "Temptation of Wife" (2008-2009). In this show, the villain is a woman with personal pain, responsible for ruining her prodigy daughter with her own hands. Her personal tragedy and a sense of inferiority make her use all means available to destroy the perfect-looking families so that they suffer the same pain as she does. "Although the scenes that I appear in were relatively shorter than other actresses, in many I had to play this important role of triggering some incident in the beginning of each episode, and developing it into the one that has potential to shred the entire family in the end," said Kim. The actress who says her acting has been "over-estimated," added it was a challenge to control her expression. "Compared with Shin Ae-ri of Temptation of Wife, who ostensibly let out her emotions; for this Ju-young character, I had to hold her pain and sufferings inside. Yet I had to retain the tension and charisma she has. So I kept on asking myself if I was playing my character right." As the drama has been immensely popular, many fans have played a guessing game on who did what and posted their scenarios. Part of drama's script has been also leaked online as well. "The strength of our drama lies in a story that goes beyond imagination. It was fun to read all those fans' guessing scenarios, some of them did really make sense and were convincing, following all those small cues on the screen. But when I receive the script, it has another surprise after another," Kim said. The actress said all the other small details made it a great drama. "As for the selection of hair styling and clothes, they were the outcomes of careful discussions among me, my staff and director to better express the scenes and character's emotional state," she said, telling a dress fitting process sometimes lasted four to five hours. "In wearing all black, I chose a high-neck collar blouse to show her firmness, while I intentionally chose black leather in blackmailing Seo-jin, the mother of her student." As for her charismatic roles in dramas, she said she was thankful for that, because they all made her the actress she is today. "I've bagged many similar strong female characters, but I try hard to express my characters differently," she said. "Creating a new character is a painstaking process that requires a lot of energy. So while I'm not acting, I try to empty myself and be easy with myself, so that I can play another strong female character in my next project." @jeijei Imagine that happened in real life? I do wonder where the scriptwriter of this drama got its inspiration/motivation to write this story. Or maybe she herself lived in a community like Sky Castle? I am having trouble waiting for the last episode. I just want Friday to come sooner...but at the same time it means that this drama will end and I NEED TO START CLASSES. @wangnyeo I can't believe I missed your post! Thank you for sharing your own story. It takes a lot of courage to recenter yourself and go on the path of healing when surrounding people only see that you have a successful career. The drama Goblin was healing for me. Still is. And now this drama Sky Castle allows me to see the perspective of where my parents come from. Every human is vulnerable, but it takes love and understanding for humans to come together and embrace each other. For some reason, I don’t hate the character Han Soo-jin. It interests me that this drama portrays such a realistic character. I love Han Soo-jin at first for how she is such a passionate, hard working and stubborn at the same time. She is a strong woman who can do anything for her daughter. At the middle of the drama, when she was hesitant of letting go of coach Kim, I felt frustrated. Indeed her stubbornness becomes her weakness, seldom her to see a situation in a different view. She was confident that her family would not get ruined since she thought they was diffderent from Young Jae’s family. and at the end when she decided to tell the truth, it wasn’t for Woo-Joo or Hye-Na either. It’s was for Yeseo. To be honest, we all want to see a character that acts right all the time like Woojoo’s mother but human tend to be selfish and self centred. It is hard to truely be selfless and sacrifice your family to someone else. I really appreciate the writter of this drama to create such complex character. I wonder what coach Kim wanted to say to Yeseo’s mother and is Hye-Na really Soo Jin’s daughter. To me ep 19 seems like the ending episode already. So ep 20 is probably a twist. When everyone thought Yeseo’s family will have a happy ending, the birth secret will probably turn them upside down. Maybe the birth secret was coach Kim’s final card and she was successful this time to make Yeseo’s family ruined. I agree with the above. I also believe that ep 19 was just to make everyone think that everything has ended and Yeseo's family will have a happy ending. I think ep 20 will give the final blow to show that YS's family will indeed be broken apart like the family in the first eps. And i still don't think HN was killed by Coach Kim? Anyone knows where to watch live tonight? Tkx. wonder what coach Kim wanted to say to Yeseo’s mother and is Hye-Na really Soo Jin’s daughter. It was revealed during Happy Together "Children of Castle special" broadcast yesterday about this. Kim Bo-Ra accidentally said that Hye-na is not Kwak Mi Hyang's daughter, after being asked by the hosts. Jun Hyun Moo asked, "Is it really not the case?" and she replied, "Yes. Can I say this?". She comments that although she knew it is not the case, she said that she thinks that the theory actually seems plausible. And﻿ i still don't think HN was killed by Coach Kim? I still have my money on Prof Cha who pushed her (unless it's the security guard? )...their family seems to already have their happy ever after without him... I thought for a while he had a lightbulb moment as he threw his ramen onto the pyramid...only to see him returning to status quo again and cleaning it off...he can't let it go. 1. I liked how Prof Kang finally stepped up and showed his mettle by meeting his Wife at the Police station. Supporting her decision and giving her the reassurance that she did the right thing by his books, and he would be there to get through the ordeal together with her. I also liked how despite SeoJin's protest that it was all her fault and she would apologise to WooJoo on her own, he stepped up again and went with her. They stood together as a family united for the first time as they faced Grandmother. 2. I liked that WooJoo didn't forgive SeoJin and Prof Kang straight away and gave meaning to HyeNa's sacrificed life. Had he forgiven them straight away without his soliloquy about HyeNa's fight for injustice, HyeNa's death would've been just that...collateral damage rather than a fight for injustice (giving voice to her departed soul). It also makes it more realistic. Kudos to the writer. I guess some of us feel it's too little too late for SeoJin. Question is - is it ever too late to say sorry? Yes it doesn't make everything right straight away but at least it's the beginning of a journey to reconciliation. Whether we get there or not in any satisfactory measure may not be the point. The point is that we start the process. 3. Mention of Exupery's Little Prince (seems to be the book of the month - it is also encountered in another drama recently) by Kay's dad as Kay the genius child peers through the telescope to view B612. Exupery's Little Prince has Rousseusque elements strewn through the little gem of a book. Jean Jacques Rousseau was an 18th century philosopher on education and a forerunner of Romanticism. He believed that natural education in children promotes and encourages qualities such as happiness, spontaneity, and the inquisitiveness associated with childhood. Rousseau advocated child-led learning, elements of which were seen in the Hwang household. 5. Pie Jesu playing in the background as Coach Kim prepares the curry meal (the Last Supper) for Kay and herself. 6. Finally, thank you @jeijei for injecting real life black comedy to this thread . Your succinct punchy comments have me in stitches. Ep 20 will deliver in spades yet again I don't doubt it for a minute. The writer has lulled us into thinking that it's all wrapped up now with Coach Kim in prison. That cliffhanger at the end of Ep 19 says ...but wait...there's more. By the﻿ way, is it a coincidence that the drama Encounter/Boyfriend and also this drama men﻿tions innocence, children and The Little﻿ Prince﻿﻿? I think it's a sign that I need to read the story especially whe﻿n both of these dram﻿a﻿s are﻿ my ﻿favo﻿rit﻿e. It's a great little book. It packs so much into it. It reads like a children's storybook but it isn't. Exupery kept condensing it from the original draft till he could condense it no more... Believing that less is more. It has baffled bookstores for years...they never know where to put it. It looks like a children's book but it's not. You can read as much or as little you want into it... Is it a hat or an elephant swallowed by a snake? Can't believe it's last ep alr!!! Anyone have links for live stream that actually worked? I can't load a few of my usual streaming sites. I hope AGB Nationwide can pass 25.5% tomorrow. Just finished the last eps of Sky Castle live. Disappointed cos there was no twist in the end like a few of us expected. It was just to tie up the loose ends. Guess the writer didn't want to make it too makjang. Anyways still AN AWESOME DRAMA!!!! Didnt get the last part tho. Coach Kim came back? They didn't show so it means it's really Coach Kim's work. I had hoped there wld be a twist there. They didn't dnt show so it means it's really Coach Kim's work. I had hoped there wld be a twist there. I watched w/o subs but i doubt i wld have missed this being mentioned. Unless it was said when my video buffered a few times. Im sure many k viewers will be disppointed cos i saw on Happy Together that many of them were trying to guess the murderer and came up w their own theories. One thing for sure, Lim Soo Im finished and published her book! And Woo Joo dropping out school! Guess I gotta wait for subsss. I think I'll probably be a little disappointed both ways, whether it was true or that it was left to viewer's interpretation. I was alll for the big revelation tonight! Strangely, I can't bring myself to weep watching HSJ sobbing regretting her wrongdoings to Hyena. Hmmmm.. Especially the part when she shut her mouth tightly even though Hyena was dying, calling KJS "dad" and he refused to operate on her. But, in some ways, I do pity and empathize her character. I don't know, I think I empathize every character in this drama. Amazing drama indeed...the writing, acting, execution, the humor, cinematography, editing...etc etc.. thumbs up!